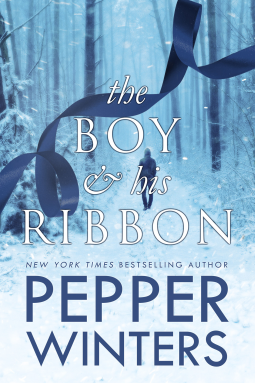 This is the first book of Pepper Winters that I have read. And it definitely will not be the last. Where do I begin? There are some books that stay with you. Have an impact on you. The characters wiggle their way into your heart, and they grab hold and vow to never let go. The Boy & His Ribbon is one of those. This book..... is EPIC. Ren and Della take you on a journey of survival, sacrificing, trust, friendship, and love. Ren's story broke my heart in the first chapter of the book. So when he took me on his journey, I loved his determination, his protectiveness, and his values. When faced with an obstacle when he discovers he took something from the farm when he ran, he had choices to make. Choices a ten-year-old never should have to face. Lets fast forward... I will not give any spoilers, so I can't go into too many details in my review. But TRUST ME.... You want to read this book. As the years go by, Ren and Della become each other's world. They are both faced with difficulties as they grow into themselves. As they try to find their way in life. There is a ten-year difference between the two. Ren always the protector, Della always the child. But what happens when Della is no longer a child? Will Ren be able to control her? Discipline her? Will their past come back to haunt them? Hurt them? When you love someone, that has the power to destroy you. The power to cripple you. That's exactly what love did to Ren and Della. Sometimes you love someone who you shouldn't. There is a difference between being in love with someone and loving someone. Do Ren and Della know the difference between the two? I devoured this book. I never wanted it to end. I went on this journey with Ren and Della and I hurt for them. My heart literally hurt for the two of them. I have to say the only thing I am mad about is... I have to wait for The Girl & Her Ren to release. I wish I could read them back to back.